We at CharJenPro take the utmost pride and care in what we do. Our designers and engineers meticulously oversees the quality of each product as well as the packaging. The team at CharJenPro wants you to have the best product at the price where quality meets expectations. You'll love them. We hope you enjoy our products as much as we took our time to produce them. CharJen your life! We took the initiative to bring you a modern take on technology and thoughtful design. The Hub is compatible with the MacBook Pro to streamline a consistent design language throughout your workspace. 3 USB 3.0 ports: generously spaced-out for the ease of plug and un-pluggability. The other side has both card readers + HDMI. USB-C charging port balances the HUB symmetry. Our 'LightningCloud' ensures a clean appearance. HDMI: 4K OUTPUT, to a monitor or TV screen. Three - USB 3.0: connect external hard drives, thumb drives, cameras, printers, scanners, tablets, phones, and legacy devices. SD card reader: HIGH-SPEED, gain access to load/unload images. Micro SD card reader (spring loaded): load music and photos on/off the card. PRESS CARD ALL THE WAY IN UNTIL YOU HEAR A CLICK. PRESS IN AGAIN TO EJECT CARD. USB-C charging port: keeps your laptop charged! PREMIUM MULTI PORT ADAPTER: Our USBC Hub works for all laptops with USBC ports. Also phones such as the Samsung S9, S9 Plus, S8, S8 Plus, S7, Note 9, Note 8, and more. 7 PORTS: HDMI up to 4K@30Hz video output, 3 USB 3.0 (3.1 Gen 1), SD Card Reader, Micro SD Card Reader, USBC Power Delivery port. Ethernet port not included. SLIM METAL BODY: Matches the design and color and compatible with the Apple MacBook Pro, MacBook, iMac Pro, iMac, Dell, HP, etc. PLUG 'N PLAY: Plug the hub and all your accessories will work as usual. USB-C power delivery port will need to be plugged if more than 1 high-powered device is connected. 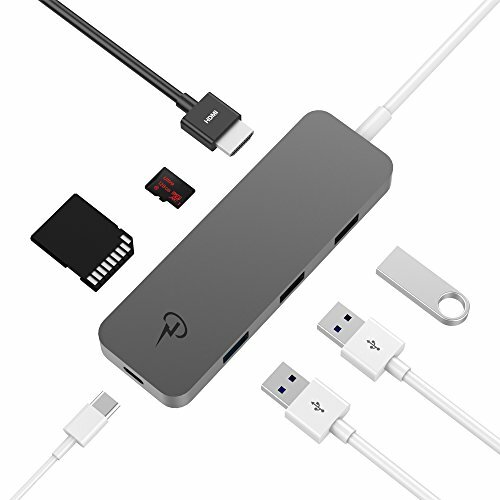 Connect your iPhone, iPad, thumb drives, SD cards, HDMI monitor cables, USB C cables. TRUSTED: CharJenPro is a U.S.A. company. IF YOU HAVE ANY ISSUE, PLEASE CONTACT US FIRST. WE KNOW HOW TO TAKE CARE OF OUR USERS. CharJenPro is the first & only company to produce this hub. If you have any questions about this product by CharJenPro, contact us by completing and submitting the form below. If you are looking for a specif part number, please include it with your message.